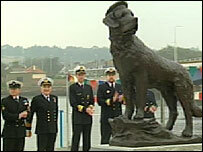 A statue of a hero dog that became mascot to the Free Norwegian Forces during World War II has been unveiled. British and Norwegian naval officers have gathered in the coastal Angus town of Montrose to immortalise the story of Bamse the St Bernard. The dog, who died more than 60 years ago, has already been honoured with the animal equivalent of the George Cross. The £50,000 bronze memorial was unveiled by Prince Andrew in front of hundreds of spectators. 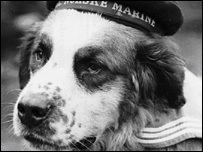 Bamse, a crew member on board the Norwegian minesweeper Thorudd, became a hero when the vessel was stationed in Montrose and Dundee during the war. His legendary exploits included saving a young lieutenant who was set upon by a knifeman and rescuing a sailor who fell overboard. Commodore Charles Stevenson, the Royal Navy's regional officer for Scotland, was joined by a delegation of naval officers from Norway at the event. Pupils from the town's schools waved Norwegian and Scottish flags to the skirl of music from pipe bands during the colourful ceremony. Bamse, which means cuddly bear, was much loved by the sailors and locals in Montrose, where he was buried in 1944. The statue was created by Scottish sculptor Allan Herriot with cash raised by the Montrose Bamse Project, an organisation founded to promote the story of the life-saving dog. Henny King, director of the project, said: "It was a colourful and emotional ceremony to celebrate the life of a legendary dog who remains very much in the hearts of the people of Montrose."